The agency is taking a new tack with polluters, giving states more of a role in regulation and enforcement and stressing education and voluntary compliance. WASHINGTON — Civil and criminal crackdowns on polluters dropped sharply in the second year of the Trump administration, according to 2018 enforcement figures released Friday by the Environmental Protection Agency. 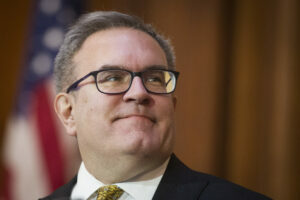 Acting Environmental Protection Agency Administrator Andrew Wheeler at EPA headquarters in Washington. The Trump administration EPA says the agency is taking a new tack with polluters, giving states more of a role in regulation and enforcement and stressing education and voluntary compliance with offenders as well as fines and criminal prosecution. “In fiscal year 2018, we continued our focus on expediting site cleanup, deterring noncompliance, and returning facilities to compliance with the law,” Susan Bodine, acting head of EPA enforcement, said in a statement. The EPA has been one of the most active agencies overall in carrying out the deregulatory goals of President Trump. Environmental and public-health groups say the business-friendly rollbacks place public health and the environment at greater risk. Declines include civil investigations carried out by the agency, which fell to 22 last year, down from 40 in 2017 and 125 in 2016, the last year of the Obama administration. Criminal fines and restitution tumbled, from $207 million in 2016, $3 billion in 2017 – including a $2.8 billion fine against Volkswagen over emissions-rigging, a case initiated under the Obama administration – to $86 million last year. Federal environmental regulators opened 129 criminal cases in 2018. That was down from 170 under the last year of the Obama administration, although up slightly from 115 criminal cases opened the first year under Trump. Numbers show overall criminal and civil enforcement to protect the environment and public health on a general downward trend for many years, but the decline has sharpened under the Trump administration. That includes a 30-year low in referrals for criminal prosecution. Civil penalties last year were the lowest since the EPA’s enforcement office was created in 1994, said Cynthia Giles, assistant administrator of that office through the Obama administration. “Not only are the Trump EPA’s enforcement numbers at historic lows, they are on track to get worse,” Giles said. EPA civil investigations and evaluations fell from 13,500 in 2016, 11,750 in 2017 to 10,612 last year.